Olympus E-410, nouveau reflex !!!! Cela faisait quelques jours que nous attendions sur le site d'Olympus une news sur un éventuel reflex. Certains parlaient d'un E-2, qu'ils auraient aimé voir succéder au E-1, mais c'est l'Olympus E-410 qui s'affiche. Le successeur du plus petit reflex actuel sur le marché arrive avec tout un tas de nouveautés. Evidemment l'Olympus E-410 restera le plus petit et le plus léger. Il se fera toujours un allier pour les photoreporters. Sa résolution reste également à 10 Mpx ce qui est largement suffisant. Cependant l'accent a été mis sur la gestion du bruit. Très décriée sur les reflex 4/3, la gestion du bruit est toujours délicate. Le E-410 bénéficie donc d'un nouveau processeur de traitement d'image, de troisième génération, pour améliorer les rendus en hautes sensibilités. De plus, sera disponible sur le E-410 une visée par l'écran de contrôle. Nous voyons ici apparaître une nouvelle orientation des reflex. En effet le Canon EOS 1 D Mark III a lui aussi pris cette initiave de proposer un cadrage via l'écran. En plus de toutes ces évolutions technologiques l'Olympus E-410 renferme un nouveau système anti poussière. Bénéficiant de 32 modes scènes et d'une mesure la lumière sur 49 segments, ce nouvel E-410 ravira nombre de photographes à sa sortie, prévue en juin 2007. 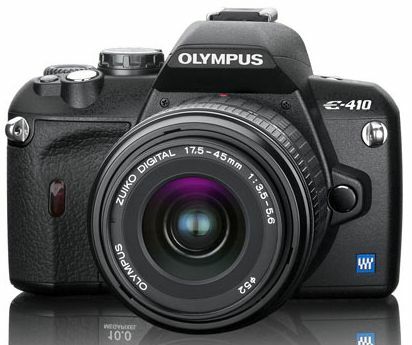 Extraordinary compactness, leading-edge technology and brilliant performance distinguish the new Olympus E-410 from the rest. This successor to the E-400 is one of the world’s most compact D-SLRs with Live Preview. Photographers benefit from exceptional mobility and are not limited to only looking through the viewfinder when framing compositions – as is the case in most D-SLRs – but can also frame their subject directly on the large 2.5”/6.4cm HyperCrystal LCD. Thanks to compatibility with the Four Thirds Standard, a supreme selection of lenses and other accessories is at the disposal of users to extend the potential areas of application. Meanwhile, a new, professional-grade Live MOS sensor ensures 10 Megapixels of high-definition image recording under all conditions. Also new is the image processing engine which features excellent noise performance. It dramatically boosts shooting results and further perfects quality. And naturally, as with all E-System cameras from the inventor of dust-free D-SLR photography, the Olympus E-410 incorporates the patented Supersonic Wave Filter. This ensures that users never need to worry about the harmful effects dust can have on their images. One of the smallest and lightest D-SLRs with Live View in the world, the E-410 gives photographers a decisive advantage. Matched with a range of ultra-compact lenses, this camera allows for virtually unimpeded mobility. It is therefore ideal for taking along on trips, holidays, photo assignments or, for that matter, to just about any shooting situation where a large, bulky camera set-up might compromise the photo opportunities. The Live View function is available for shots with both auto focus (AF) and manual focusing (MF), allowing scenes being framed to be viewed directly on the 2.5”/6.4cm HyperCrystal LCD. The AF function is enabled by simply pressing the AEL/AFL button, which prompts the mirror to fold down momentarily and then quickly pop back up again once the AF measurement has been made. The MF option, meanwhile, allows for superior focusing accuracy as images on the LCD can be enlarged by 7x or 10x. It is therefore ideally suited for macro shooting. It meets just about every professional demand, yet the E-410 proves that high performance needn’t mean difficult operation. In addition to offering an abundance of adjustable exposure options, including full manual control for unlimited creative freedom, 32 consumer-friendly shooting modes are on board for ease-of-use in all manner of situations. These range from Portrait and Macro to Underwater Wide, Underwater Macro and xD Panorama. Meanwhile, photographers can make use of various colour modes and Black&White filters. What’s more, Live View functionality allows users to preview and manage tedious adjustments such as exposure and WB compensation right on the LCD – so photographers can revel in the unique comfort and control this added convenience affords them. Users benefit from nearly boundless versatility when choosing accessories for their E-410 thanks to compatibility with the Four Thirds System. This standard is supported by a growing number of companies and ensures full cross-manufacturer compatibility of lenses. In addition, almost the complete line-up of E-System accessories can be used with this model. This includes first-class, near telecentric lenses that cover the full scope of focal ranges from fisheye to ultrazoom. Since Four Thirds Standard lenses are built specifically for the rigorous demands of digital photography, they can achieve higher-aperture shots without being as big and bulky as their non-Four Thirds counterparts. The E-410 also comes equipped with a long-lasting rechargeable battery that will ensure power requirements are met – even if the shoot goes into overtime. And for capturing beautiful motifs up to 40m below the water’s surface, the Underwater Case PT-E03 is available. When it comes to those underwater shots, count on bright Live View to make the experience even more rewarding: Get a better and more accurate view of compositions before you shoot them – and take the guesswork out of D-SLR underwater photography. As one of the world’s most compact D-SLRs with Live View capability, the E-410 boasts two very convincing arguments. Matched with a high-performance image sensor and a fast new image engine featuring outstanding noise characteristics, ambitious photographers can look forward to superior picture quality and excellent handling that exceeds expectations – while retaining amazing mobility. This intriguing member of the E-System family will be available from June 2007.